After two miserable games in San Francisco, the Dodgers managed to salvage the series finale against the Giants, thanks largely to an outstanding effort by Clayton Kershaw. With Grandal on second base, Cueto got mad at him for supposedly relaying signs to the batter. When Grandal next came to bat, Cueto threw a brushback pitch that came much too close to Yasmani’s head (and led to another Dodger run coming in to score). 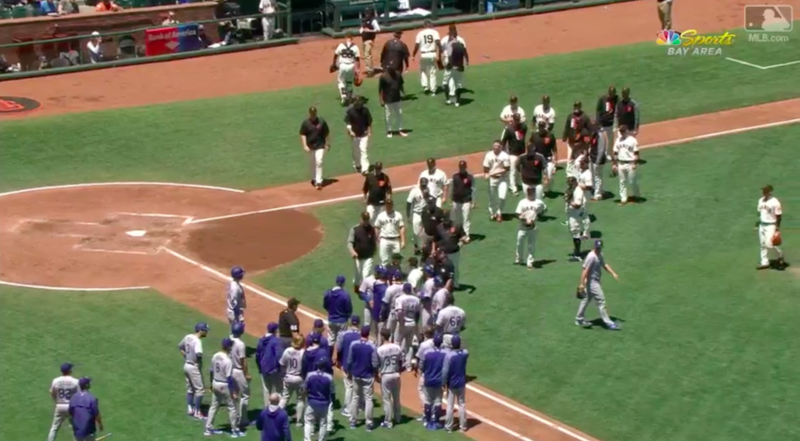 When the inning ended, the benches cleared, though there were no actual physical altercations. Clayton’s such a stickler for his routine, he doesn’t have time for things like brawls getting in the way of that. Speaking of Kershaw, this was easily the best he’s looked all season. He delivered seven scoreless inning and allowed just three hits (one a 65 MPH liner up the middle, one a 67 MPH liner just over Seager’s head, and a Buster Posey blooper to center). Most encouragingly, it seems Kershaw may have finally figured out his slider. Rather than throwing it in the low 90s as he has been for much of the season, today he was throwing it around 86-89 MPH, and getting the results he wanted, with four of his five strikeouts coming via that pitch. At only 89 pitches, Kershaw likely could have kept going, but the Dodgers were courteous enough to provide enough runs that it seemed safe to let him come out after seven. They’d add another run off of Josh Osich in the seventh inning. Osich walked Seager, and Cody Bellinger brought him home with a double, his second of the day. Pedro Báez pitched a scoreless eighth inning, and then Sergio Romo allowed a home run to Eduardo Núñez in the ninth inning, ending the Dodgers’ hopes of a shutout. Still, he managed to seal the victory, and send the Dodgers home on a happy flight. 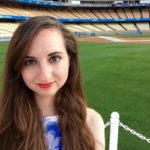 The Dodgers now return to Los Angeles for a four-game series with Don Mattingly‘s Miami Marlins. Tomorrow, Hyun-Jin Ryu (4.99 ERA, 5.08 FIP, 1.598 WHIP) gets another shot, going up against old friend Edinson Vólquez (4.41 ERA, 4.56 FIP, 1.673 WHIP). First pitch is 7:10 PM Pacific.